If the name Anthony Horowitz sounds familiar to you, it’s probably because you’ve seen it in the credits for Midsomer Murders or Foyle’s War, amongst other television works. Or because you’ve read his Holmes novels, Moriarty and The House of Silk; or Trigger Mortis, which contained original material from Ian Fleming; or perhaps his YA Alex Rider series. Yes, quite the prolific and successful author in multiple genres. 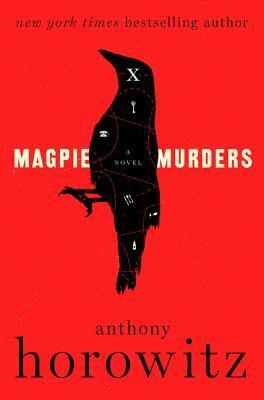 Yet Horowitz manages to pull off a coup quite unlike any other with his newest mystery, Magpie Murders. This is a clever and compelling romp, paying homage to the writers of the Golden Age with a mystery novel-within-a-novel. Readers are introduced to editor Susan Ryeland, whose client Alan Conway’s Atticus Pund series has kept her publishing house afloat. There should be an umlaut over that “u” in Pund, but Auntie M’s keyboard doesn’t have that diacritical mark. It’s another way that Conway plays with his readers. And play he does, with increasing contempt, for Conway could be snarky, and as Susan soon discovers, not just to her. Susan is delivered Conway’s newest and last manuscript, where he’s decided to kill his detective off. Over the weekend as she reads it, so do we, becoming submerged into 1950s England outside Bath, and we and she are presented with a period-perfect murder mystery, complete with many references to classic works. But as Susan reaches the end of the manuscript, she finds to her dismay–and ours–that the denouement chapter is missing. When Susan returns to work Monday, searching for that last chapter, she finds that Conway has committed suicide. The novel turns into a contemporary mystery, as Susan takes on the detecting of issues surrounding Conway’s death, trying to find the missing chapter, and soon becomes convinced his death could be murder. As she travels to his home and his funeral, meeting those in Conway’s circle, she connects many of the devices Conway used in the book with his real life. It’s not a pretty picture that emerges, and there are far too many candidates for the role of murderer. And where is that missing chapter? This is a hugely satisfying read, containing puzzles, anagrams, literary motifs and more, including a gentle send-up of today’s publishing world. It’s garnered wonderful enthusiastic reviews and this is one more. Highly recommended.